Django – Setup Django REST framework | Eureka! We have the Django welcome page working already. I would like to create some REST services on that setup. We could make use of the Django REST framework. Let’s keep working on our <project_root>/django_poc project to manage articles by REST. The example in this post are based on the Django REST framework quickstart tutorial. It’s good to go through all of them which could give you a more thorough idea on how the REST framework works. 1. Install the Django REST framework in your virtualenv. 2. Create a new app called articles. 3. Configure the sqlite database in <project_root>/django_poc/settings.py. 4. 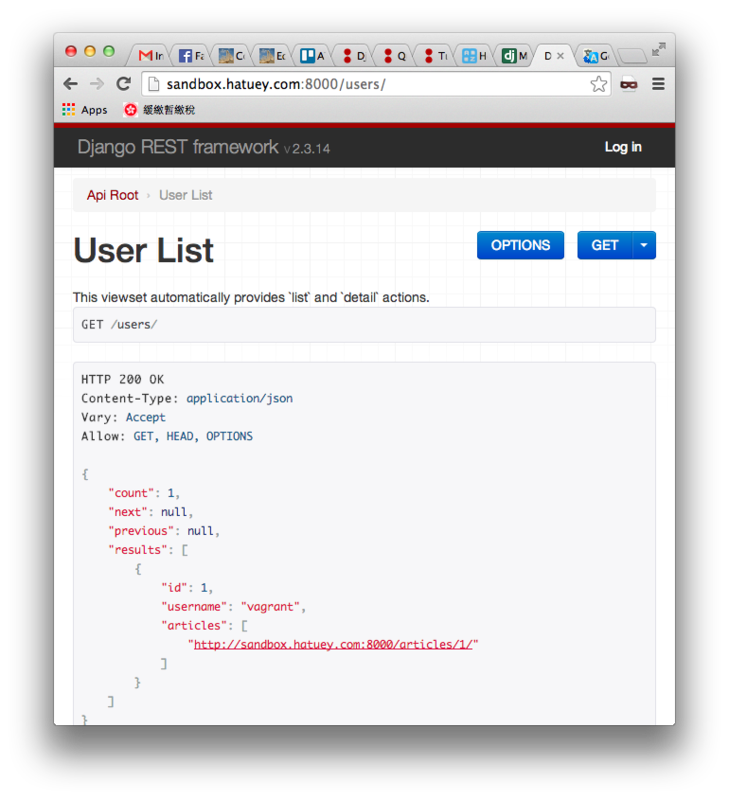 Configure INSTALLED_APPS to include the Django REST framework as well as the newly created articles app. Also add the pagination setting of the REST framework. 5. Setup the articles routes in <project_root>/django_poc/urls.py. 6. Let’s create the Article model. 7. Since we have setup a new model, execute syncdb again to create the article table. 8. Create the serializer for interconverting the article and user instance and json. # hyperlink the articles to the correspongind page. 9. Create the views by the Django REST framework ViewSet. 10. Setup the views permissions. Custom permission to only allow owners of an object to edit it. # so we'll always allow GET, HEAD or OPTIONS requests. # Write permissions are only allowed to the owner of the article. 11. Setup the routers for the articles app. # Create a router and register our viewsets with it. # The API URLs are now determined automatically by the router. # Additionally, we include the login URLs for the browseable API. 12. Finally we can start the application. 13. Open the app in browser. 14. You can log in and create new article on the article listing page. 15. Here are some curl commands for testing the API. Pingback: Django REST framework – Create endpoints for custom actions | Eureka!